Interestingly my province, Ningxia Hui Autonomous Region, was mentioned a few times as a bellwether situation. Yinchuan sits nestled in a bend of the Yellow River - acting as a shield against the shifting sands - but few realize the delicate situation. Although two months ago, I still vividly remember staring out the grit streaked window and seeing a quiltwork of cracked earth flowing from the horizon and sweeping itself into a billow behind the bus. Small stone outcroppings standing watch over the tan expanse and the small ragged plants dotting the ground. However, approaching Yinchuan, a thin ribbon of green slowly attached itself to each side of the newly built highway. How could this be? Dense green fields of wheat. Yet, mere feet from the edge of each oasis - pebbled, bone dry grit - not a drop of water to be had. And then a small sign, hardly attesting to the importance of what lay below, “Huang He.” The Yellow River. 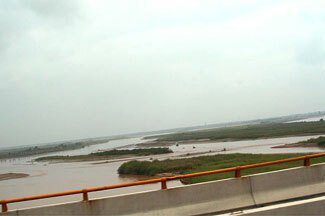 Traveling here in Ningxia and Shanxi I marvel at the ability of the Yellow River to have lasted this long. Every person in Ningxia owes part of their life to this now silt-stained river and they begrudgingly, if at all, admit to the precarious situation around them. I see my students and their families depend on this river, a river at its breaking point. In an area where a small bowl of rice is a feast, to ask for the conservation of water seems cruel, yet how can we not? Gimli! - If a Boeing 767 runs out of fuel at 41,000 feet what do you have? Answer: A 132 ton glider with a sink rate of over 2000 feet-per-minute and marginally enough hydraulic pressure to control the ailerons, elevator, and rudder. Waves in a Large Free Sphere of Water - Narration could use some spice, but what do you expect from a rocketman? Water behaving like, well, water. In space. The Optimus Keyboard - Yes. It’s a keyboard. Now I wouldn’t generally go getting all excited about one but this is different. Imagine a keyboard that changes its keys like an octopus changes color. Pop over to a game? The space bar becomes a red fire button to pound opponents with. I’ve been watching Art Lebedev for a long time, but I figured that this was close enough to the pre-order date to get it in your heads….